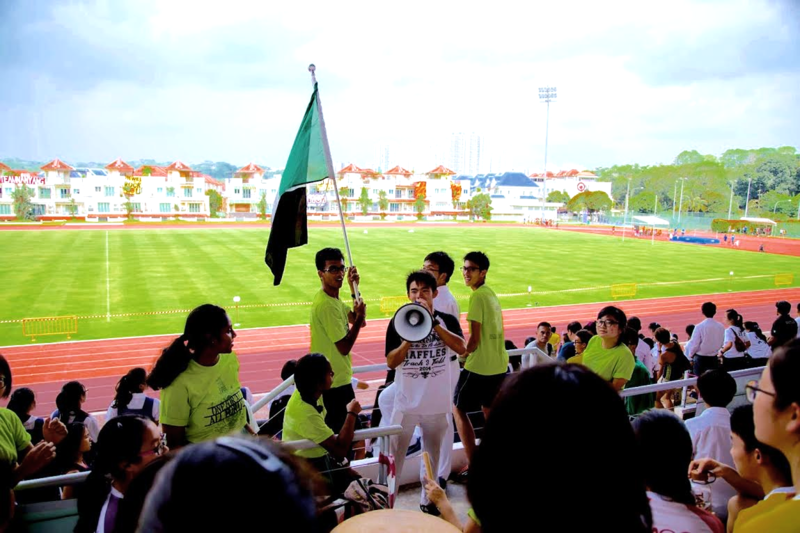 Rafflesians cheer loud and clear under the rallying of Trackers and Councillors. 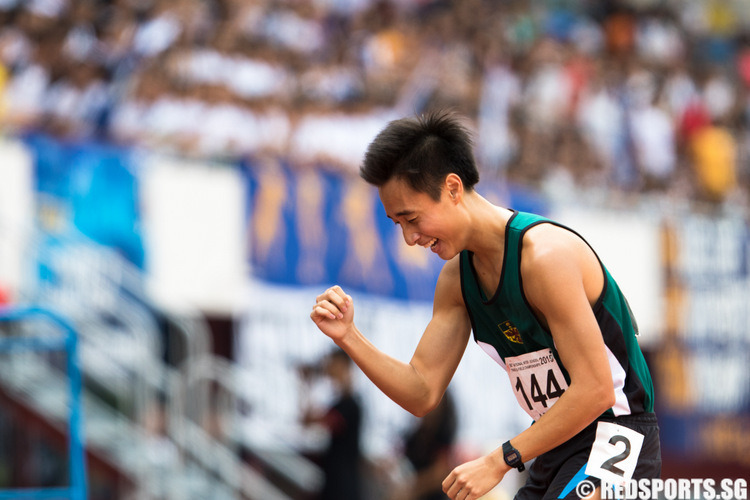 The humid Wednesday afternoon may have been typical of your average Singapore afternoon, but there was anything but the usual happening at Choa Chu Kang Stadium; for it happened to be the fateful day on which Raffles Institution’s Track and Field team was due to compete in the final leg of the national Track and Field Championships. The stadium itself, even before the races had begun, was already full of the hustle and bustle of competitors from various schools preparing for their various events, as well as their eager supporters arriving in droves. While our athletes were busy warming up, an undercurrent of tension was coursing throughout the stadium. There soon came a growing sense of anticipation among the feisty supporters in the Rafflesian audience, when it was time for the races to begin. Laura Tan in a close fight for 3rd place. Unfortunately, after the neck-and-neck race, she ended up fourth. 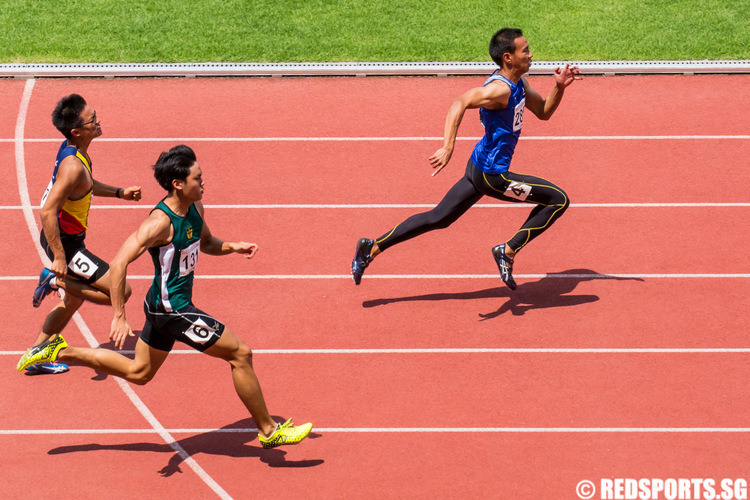 The first event was 100 Metres in Sprints. After a close dash in which all participants finished under 14 seconds, Laura Tan Ling Ying came in 4th place with a timing of 13.22 seconds, just a mere 0.2 seconds after Jerrinne Lim from Anglo-Chinese Junior College. Laura was also the Champion for 100m hurdles event. 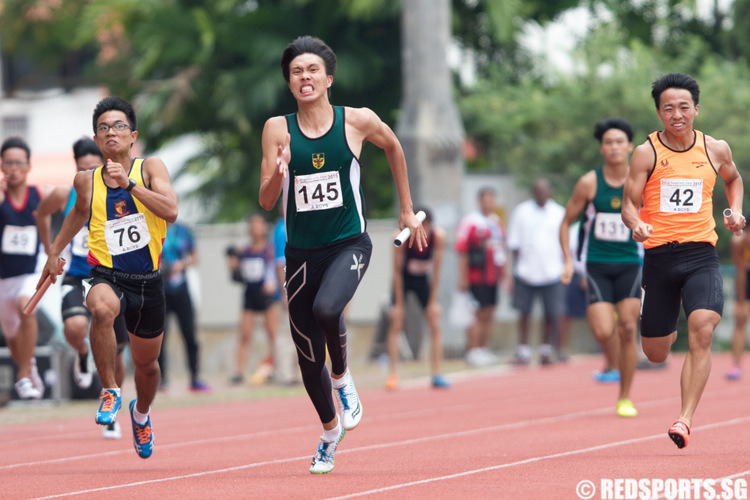 Next up was the 100 Metres (A-Boys), in which Kennard Chin earned 2nd place with a timing of 11.18 seconds. Lee Jun Lei was 7th with a timing of 11.62 seconds, and Poy Meng Han Ian came in 8th just 0.1 milliseconds after Jun Lei. Kennard Chin (2nd from left) sprinting past the finish line behind the first-place runner from Millenia Institute. 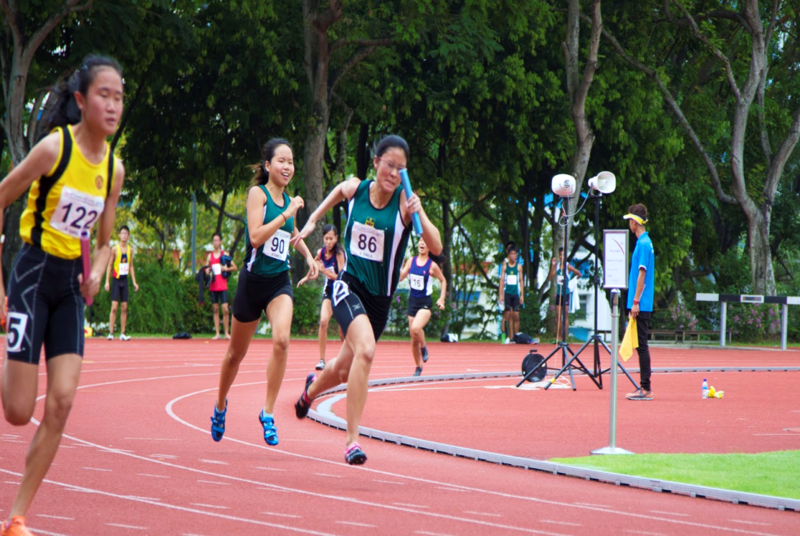 The 800 Metres (A-Girls) race saw Team Raffles clinching the top two positions. Having run at the front of the pack throughout the race, Haidah and Natalie established a considerable lead in the last 300m. The duo got off to a long kick, with Natalie ahead of Haidah. Unfortunately, a stumble near the finish line saw the pole position handed over from Natalie to Haidah, who finished just 0.12 seconds ahead with a timing of 2 minutes 26.58 seconds. What made her achievement more admirable was how, as Natalie commented, she had been exposed to a new pace this season. Natalie and Haidah congratulating each other after their victory. Next was Marianne, who also gave her all for the race, coming in 7th with a timing of 2 minutes 44.79 seconds. Marianne, fully in the race. 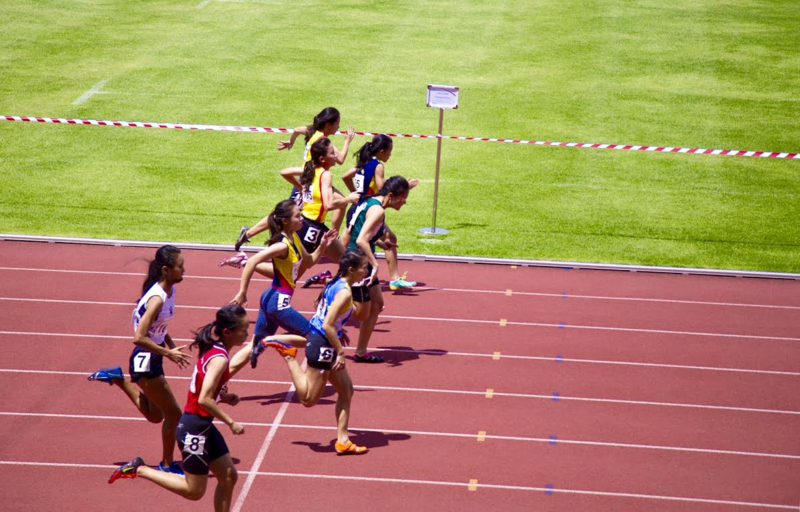 In the next event, the 4 x 100 Metres Relay (A-Girls), Team Raffles was closely overtaken by HCI team at the third runner. Eventually, they came in 3rd with a timing of 52.09 seconds, a little more than 1 second behind first place HCI. Laura Tan from RI trailing closely behind ACS(I) and HCI runners during the final 100m of the relay. Jun Lei, with baton in hand, speeds ahead for the team. By then, ominous clouds had gathered in the Westward sky. Still, the events continued. All the Rafflesians present, from Year 1 to 6, cheered vivaciously for the trackers and kept spirits up. Bryan after clearing a jump attempt. 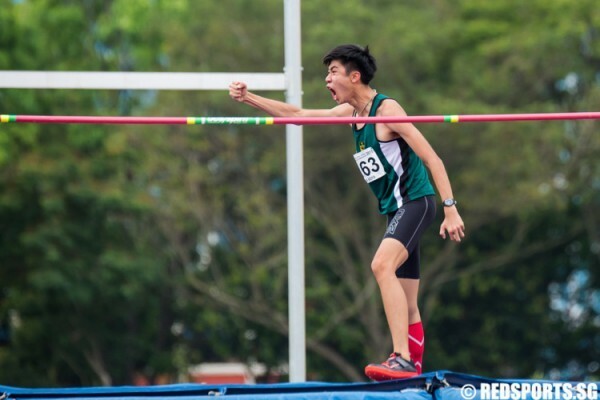 High Jump (A-Boys) was the event next in-line, in first place was Wong Jingkai Bryan, with a stunning height of 1.95m. Zong Sim Hao from HCI also attained the same height, but a count-back determined Bryan’s 1st place. 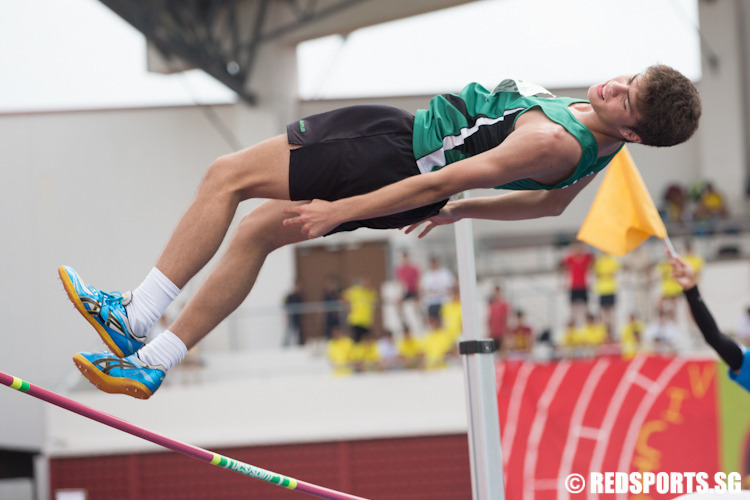 Outside this championship, Bryan had previously achieved a height of 2.01m, hence, it was understandable that afterwards, despite his first placing, Bryan felt there was room for improvement with his sub-2 metres result. However, he was determined to do better the next time round. Blazer, triumphant as he completes a jump attempt. The stellar showing by our team also marked the first time Rafflesians clinched the high jump gold medals in the boys’ C, B and A divisions. Shohib (extreme left), also a Crosser, is accustomed to running long distances. Due to the imminent downpour, the last event of the day was the 1500 Metres (A-Boys) event. Shohib led from the start while Glen Palmer and Paxton Hong of Victoria Junior College trailed 5 metres behind, along with the rest of the pack. Shohib continued to widen the lead in the second round. His teammates, Larry Law and Chester Lee, followed his lead and overtook Glen and Paxton.”It really boiled down to the last lap.” Larry remarked. By the third lap, Shohib had sprinted ahead to establish a 15m lead and eventually finished almost five seconds ahead of his teammate, Larry. Thus, Shohib B Abdul Wahab Marican finished in 1st place, with Law Ann Liat, Larry concluding the race in 2ndplace. Shortly after, Lee Zhong Kian, Chester followed past the finish line in 4th place. Prior to this event, Shohib had won the champion titles for the 5000m event and March Cross Country events. 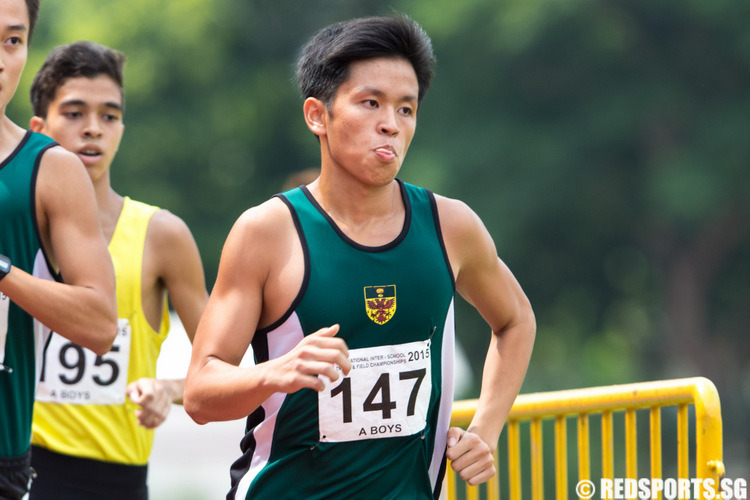 He also led the Raffles Institution team to a podium sweep last year. Chester shows no signs of stopping during the 1500m race. Unfortunately, the 4 x 400 metres relays for both the A Division Boys and Girls were called off due to the rain, and carried out on another day. 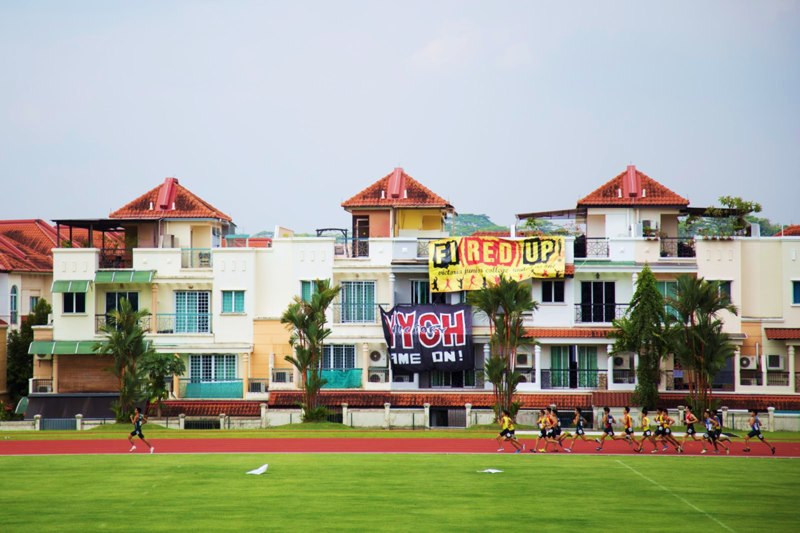 After the completion of all the events, Raffles Institution’s A Division Boys had come in 2nd Place, while the A Division Girls had come in 3rd Place. After the competition, the Captains of the Girls’ and Boys’ teams also had many important insights to share. Raffles Press would like to commend the Track and Field team for their laudable performance despite the odds stacked against them. May everyone continue to persevere with ‘their teammates beside, and their limits behind’! 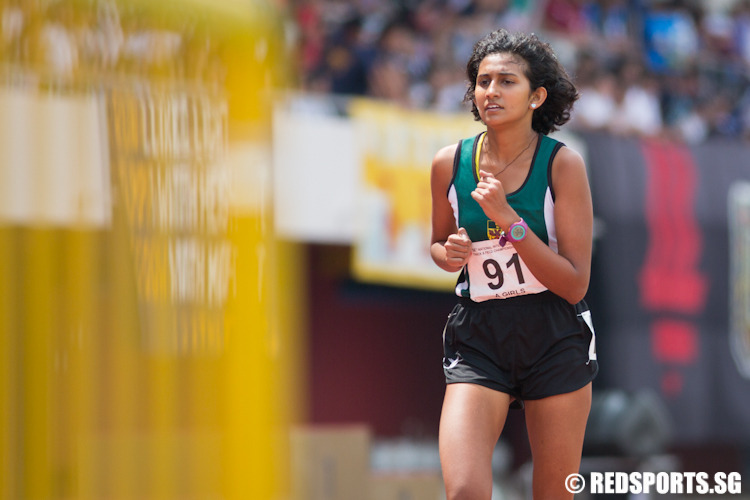 The results of the 2015 National Inter-School Track and Field Championships can be viewed here.